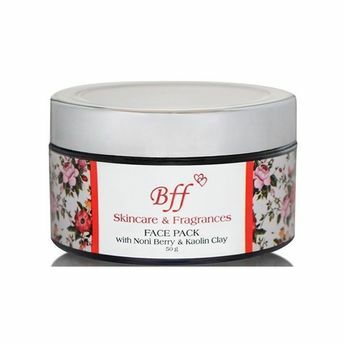 Detoxify & Cleanse with BFF Skin Care's Kaolin Clay Face pack. The gentlest of all cosmetic clays, Kaolin is an innate remedy for sensitive, acne prone skin. It soothes rashes redness and irritated skin as well as improves skin tone. Noni Berry: Enriched by an impressive gamut of healthful Vitamins, and other Phytonutrients. It promotes cellular regeneration & tightening. Kaolin Clay: A naturally occurring clay is highly absorbent with abundant mineral content. It stimulates the skin cells & support nutrient absorption.